Sandalwood has a rich, balsamic, sweet fragrance with delicate wood notes that add to it's reputation as a luxurious and exquisite oil. Sandalwood is an evergreen, parasitic tree that burrows its roots into other trees and it can grow up to 9 meters (30 feet) high and has a brown-gray trunk, many smooth slender branches, leathery leaves and small pink-purple flowers. It can take thirty to sixty years for a tree to reach full maturity. That is when it can be harvested and distilled. Sandalwood Oil is used by aromatherapists to combat bronchitis, chapped and dry skin, depression, laryngitis, leucorrhea, oily skin, scars, sensitive skin, stress, and stretch marks. It also has historical applications as an aid in meditation for religious ceremonies. 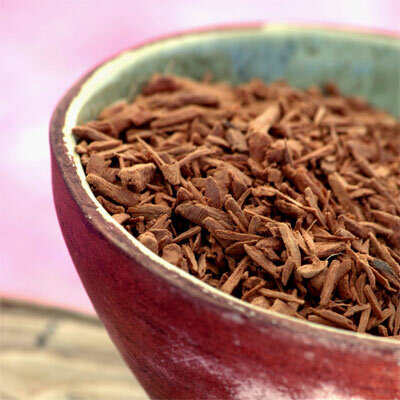 Sandalwood East Indian is believed to create an exotic, sensual mood with a reputation as an aphrodisiac. It also has extensive uses in the perfume industry as a fixative, and use in body care products for the fragrance it provides. The documented use of Sandalwood goes back 4000 years to India, Egypt, Greece and Rome. Many temples and structures were built from Sandalwood and the Egyptians used it in embalming. This practice has steadily decreased to the point where Sandalwood East Indian is now only being used for the distillation of oil. The largest reason for this is the over-harvesting of the tree coupled with the 30 year period required for the regeneration. Sandalwood Oil is considered non-toxic, non-irritant and non-sensitizing oil.